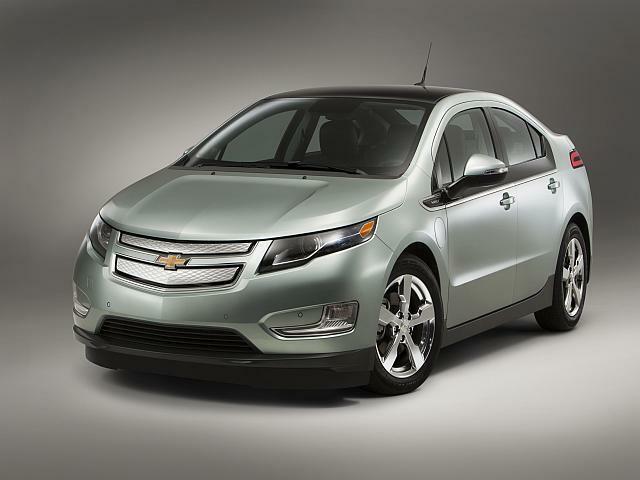 Chevy Volt a bad sign for electric car sales? Does General Motors' (GM) five-week production suspension of the Chevrolet Volt because of oversupply cast doubt on whether electric cars can sell in volume at current prices? The analysts at Edmunds.com think so. "The oversupply of Volts suggests that consumer demand is just not that strong for these vehicles," says Lacey Plache, Edmunds chief economist. Plache notes that high price is a drawback. "The price premium on the Volt just doesn't make economic sense for the average consumer when there are so many fuel-efficient gasoline cars available, typically for thousands of dollars less." GM says its temporary Volt shutdown and idling of 1,300 workers is necessary to get its inventory levels in line. The company sold 7,671 Volts last year -- well short of its 10,000 target. And selling 1,626 in the first two months this year is far below the pace needed to hits its original 2012 sales goal of 45,000. In addition to the price issue, Volt sales stalled with news that Volt battery fires had broken out after the cars were crash tested. The National Highway Traffic Safety Administration pronounced the Volt as safe as gasoline cars, but the issue clearly put off some shoppers. Even with gas prices rising and expected possibly to approach a national average $5 a gallon by summer, the Volt price level -- about $41,000 before a $7,500 federal tax credit -- remains a problem. Edmunds senior analyst Michelle Krebs points out that even at $5 a gallon, gas savings on the Volt (rated at the equivalent of 95 MPG in city driving and 93 on the highway) would take nine years to pay back the price differential over the similar-size Chevrolet Cruze. The Cruze is rated at 25 MPG city, 36 highway and has an average selling price of $19,656 according to Edmunds' data. The Volt's major competitor, the Nissan Leaf -- at $32,780 before the credit -- fares slightly better in this comparison with gas at $5 a gallon. The all-electric Leaf (the Volt has a back-up gasoline engine) would pay back the price differential over a Nissan Versa in five years, Krebs says. Leaf sold 9,674 in North America last year and 22,000 worldwide. Slow Volt sales seem to complicate auto company plans for using electrics and plug-in hybrids to meet stringent federal mileage standards for 2016 and beyond. But new electric models keep on coming, with about a dozen new models scheduled for introduction this year and a similar number in 2013. Ford's (F) electric Focus goes on sale this month in California, New York and New Jersey. Just last week Ford trumpeted that its mileage equivalent ratings (110 city, 99 highway) topped the Nissan Leaf, making it the most fuel-efficicent vehicle in the U.S. But with a list price of $39,995 before the federal credit -- just below the Volt and above the Leaf -- will likely have a price issue as well. The most expensive gasoline-powered Focus, rated at 26 MPG city, 36 highway, lists for $22,700. The tough federal mileage requirements for 2016 and 2025 have pushed automakers to sharply improve efficiency of their gasoline engines. They are using technologies like turbocharging, gasoline direct injection and so called idle stop, which shuts the engine off at a traffic light or other full stop then restarts it smoothly. The result has been a number of small cars that are rated for 40 MPG on the highway. With such choices, shoppers likely will remain reluctant to pay much more for the new, unfamiliar technology of plug-in electrics.